Our equipment, and why we use it. We have frequently been asked why we prefer to use the equipment we have over cheaper, recreational grade GPS gear. The answer lies in the abilities of the equipment, and the nature of GPS itself. GPS satellites are in reality sophisticated radio stations which contain precise atomic clocks. The satellites all broadcast a complex information string simultaneously on the second. A ground GPS receiver determines the distance to a satellite in space by calculating the amount of time it takes for a radio signal to travel the 12,000 miles or so from the satellite to the receiver on the ground. Radio waves travel at the speed of light (approx 186,000 miles per second), so it takes about 1/15th of a second for a signal to arrive from space to a receiver. By measuring the tiny time differences of when signals from several satellites arrive, it is possible to calculate how far away each satellite is from the ground receiver. The satellite positions are exactly known, so the relative position of the receiver may be established mathematically via a triangle calculation known as trilateration. Since the signals travel so fast, anything that interferes with the speed of the signals degrades the accuracy of the position on the ground. There are a number of environmental factors that greatly influence the timing, and thus the accuracy of the position. The atmosphere has a drag on the speed of the signals, so signals from satellites low on the horizon must pass through more atmosphere than those higher up. These slower signals degrade the calculations and a weaker position results. A similar effect is caused by trees, where the signal is slowed by being reflected minutely by leaves and branches. This also creates static, or noise in the signal. Another factor is the relative positioning (geometry) of the satellites themselves. If using a GPS in open terrain, satellites generally will be observed in many directions, and ideal triangles are formed for the calculations. When surveying in a mountain valley, satellites may only be observable in a limited direction. The resulting triangles are long and narrow, and positions are less accurate. Now to the question of equipment. Recreational grade receivers are built with a inexpensive quartz crystal type clock. When the receiver first locks on to a signal, the clock is set. Remember, it only takes slightly over 1/15th of a second for the signal to reach the ground. The clock has to be able to divide a second into very small parts to accurately establish a location. The smaller the parts, the better the results. Pro grade receivers have better clocks than the recreational versions. The survey grade receivers deal with the issue of satellites being low on the horizon by excluding these satellites from the solution. They recognize noisy signals by measuring the amount of static in the signal. The user can set a noise threshold which excludes the worst signals from the calculations. Geometry issues are resolved in the pro units by analyzing the geometry of a position, and either recording the geometry information, or excluding the data from being used. The recreational units generally use all data from all sources, regardless of geometry, noise, or altitude above the horizon. They provide a position, but accuracy is diminished. The professional class receivers are capable of differential GPS. This procedure incorporates data from another survey grade GPS receiver running at a fixed reference station during the exact same time period as the field unit. The reference station must be fairly close to the field unit, and both units must observe the same satellites simultaneously. Simply stated, corrections for the positional errors observed at the reference station are applied to the field unit. This method is used in almost all high quality surveys using GPS, and provides the key to accurate work. The field unit must record detailed raw satellite data for each recorded observation. The recreational units are incapable of this, as they record only positions, and not raw data. A typical uncorrected position from a professional GPS has a accuracy if +,- 15 meters prior to differential processing. With differential, and under ideal conditions, the PRO XRS unit provides sub-meter accuracy, and the GeoExplorer provides accuracies of 2-5 meters. All of the TRT data was post processed utilizing government base stations in Carson City and other nearby locations. We are currently using several different models Ashtech MobileMapper units for out work on the CDT. These have sub meter accuracies. Another problem facing GPS that affects both the recreational and professional grade receivers is called multipath. This results when a signal bounces from a planar surface before being received by the ground unit. This may result in wildly erroneous positioning, and is a common problem when using GPS in extreme mountain environments. 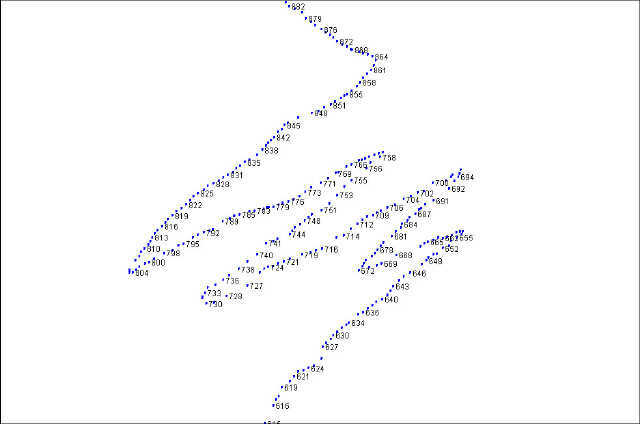 It is somewhat random, and processing doesn't resolve it. We deal with this issue by recording much more data than we need, and carefully discarding abnormal or inconsistent data. With the exception of trails that were once designed and surveyed logging roads, most trails have been spotted on maps by cartographers utilizing aerial photography. The problem with this method is that tree and ground cover obstructs much of the trail, and huge sections must be "guessed" by the person drawing the map. This has resulted in trails that are hundreds, even thousands of feet from where they actually are. Once placed on a map, trails often remain in the original alignment despite re-routes or other changes. 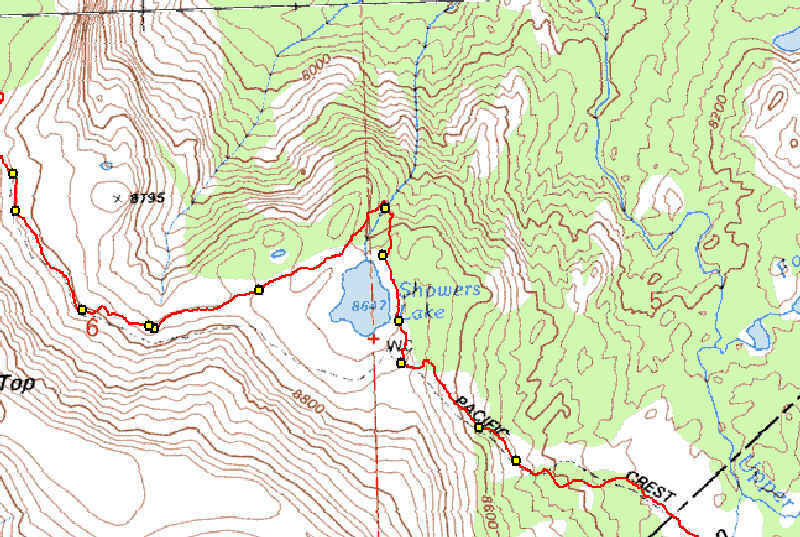 Most digital map programs on the market have a tool for marking a location on a map, then exporting that location to a GPS receiver for use by a hiker. If the trail isn't really where it appears on the map, the hiker can be downloading seriously flawed information with potentially dangerous repercussions. This dilemma is resolved by traveling the trail with good equipment, gathering large quantities of GPS data, and processing it to be as accurate as possible, given the difficult terrain . Then, when a user loads a position into a personal GPS, that position is known with a great deal of certainty to be valid. Check out the examples below. These are but a few of many places where the USGS maps do not show today's trail position correctly. Switchbacks on map are 700 feet from actual position, with different appearance. 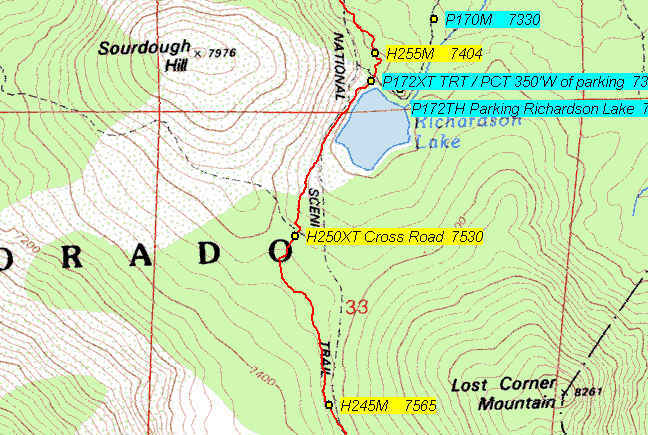 The existing maps showing the Richardson Lake access point are so confusing that we re-mapped the entire route in. We spent two hours looking for the trail which turned out to be 350 feet from where we had parked! Switchbacks test the power of GPS. 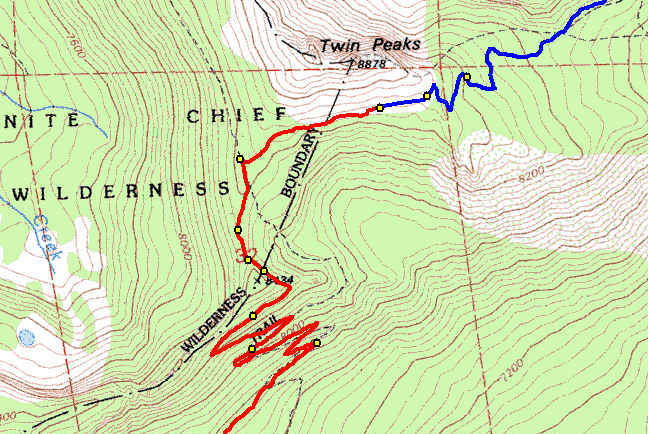 This is data from near Twin Peaks in section H. The first image shows the 267 GPS points used to depict the switchbacks. 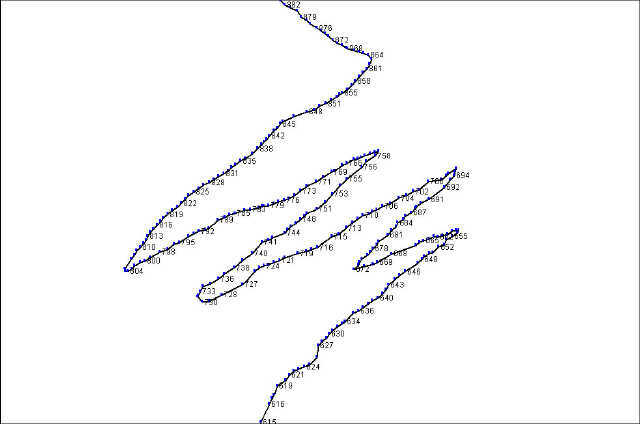 The points are connected by lines, then precisely overlaid upon a digital map image.